Bombay had 37.1 inches of rain on Tuesday! Wow. It's a version of the other photos I've been posting, of Long Island Sound. The black space in the middle is water. The lights are Connecticut. Nothing is going on. The trains stopped running, so people walked along the tracks to get home. The photo is by a cat named GrayArea. Click on the picture (or here to see it in its original context. 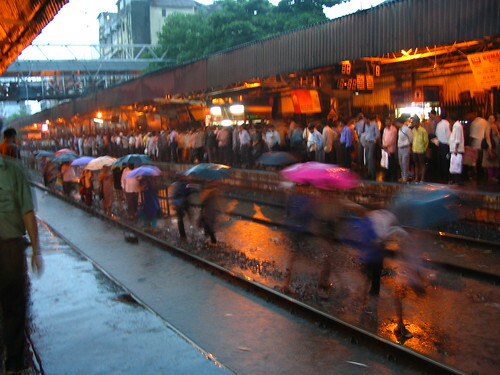 More Bombay Flickr photos here. At some stations, even that wasn't possible. Thousands (millions?) of people were stranded. They seem to have handled this pretty well. 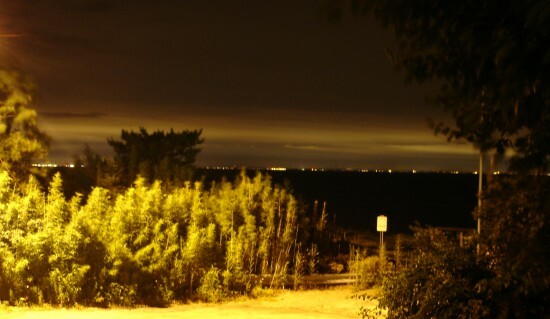 Did you do something in processing to the lighting in the Long Island photo? It's really wonderful looking. Nope, that's how the photo came out. No photoshopping, contrast changing, nothing. I swear it on my Sony Memorystick, I do. Actually, my camera has this funny setting called "M." I don't know what it means (probably "Manual"), except that when I use it, the exposure lasts as long as I hold down the button. Late at night, with very small amounts of light, you need to hold the button down for a long time to get any kind of picture. That's what I did here. Oh, and the camera has to be absolutely still. I put it on a railing and took a very, very deep breath. Great shot of LI. Have been following your blog for a while. Enjoy reading it. Re: holding your breath for a while to take the snap...dosent the camera have a self timer. I usually use that to click snaps of this kind...and the self timer works with the manual settings, so it remains open as long as u have set it to be. I am assuming you have a Digital-SLR. (not the regular digicam). The 'M' indeed stands for manual. I use it a lot, while experimenting night-shots, to create blurs..and such-like. I have an excellent blurred trail of lights of an expressway (exposure time was 15-20 secs :) )..Can't locate it. Will send it over, if I manage to dig it thru my archives. Chk out my july4th photos to get an idea of what I mean. Mine is regular film-based SLR by the way. I think anonymous is rightly surprised, as I am, as to how come the trees on LHS of LongIsland pic are bright? Was there a lamp or some source of light on that side? It's an excellent shot!Its' very rare to get such lighting outdoors. Yes, there was a street lamp off the edge of the frame. It normally casts a small amount of light, but over a long exposure the light intensifies (as you probably know). And yes my camera is a simple digital SLR -- Sony Cybershot DSC-W1.